Control 4 USB computers from a single USB keyboard, mouse and monitor... and add audio support for speakers, too. IOGEAR's hot key-switched USB KVM switch has 2 cable sets built-in and includes additional sets for expansion up to 4 units. 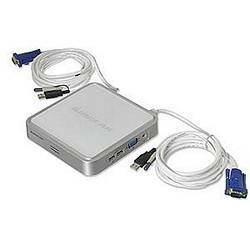 Requires analog monitor with DE15 (HD15) connector, and PCs or Macs with Microsoft Windows 98SE/Me/2000/XP/Vista, Sun Solaris, USB Linux or Mac OS 8.6+.